Citation Information: J Clin Invest. 2005;115(3):774-779. https://doi.org/10.1172/JCI23625. Essential tremor is the most common movement disorder and has an unknown etiology. Here we report that γ-aminobutyric acidA (GABAA) receptor α1–/– mice exhibit postural and kinetic tremor and motor incoordination that is characteristic of essential tremor disease. We tested mice with essential-like tremor using current drug therapies that alleviate symptoms in essential tremor patients (primidone, propranolol, and gabapentin) and several candidates hypothesized to reduce tremor, including ethanol; the noncompetitive N-methyl-D-aspartate receptor antagonist MK-801; the adenosine A1 receptor agonist 2-chloro-N6-cyclopentyladenosine (CCPA); the GABAA receptor modulators diazepam, allopregnanolone, and Ro15-4513; and the L-type Ca2+ channel antagonist nitrendipine. Primidone, propranolol, and gabapentin reduced the amplitude (power) of the pathologic tremor. Nonsedative doses of ethanol eliminated tremor in mice. Diazepam, allopregnanolone, Ro15-4513, and nitrendipine had no effect or enhanced tremor, whereas MK-801 and CCPA reduced tremor. To understand the etiology of tremor in these mice, we studied the electrophysiological properties of cerebellar Purkinje cells. 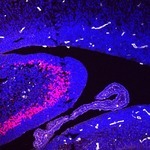 Cerebellar Purkinje cells in GABAA receptor α1–/– mice exhibited a profound loss of all responses to synaptic or exogenous GABA, but no differences in abundance, gross morphology, or spontaneous synaptic activity were observed. This genetic animal model elucidates a mechanism of GABAergic dysfunction in the major motor pathway and potential targets for pharmacotherapy of essential tremor. Citation Information: J Clin Invest. 2005;115(2):258-267. https://doi.org/10.1172/JCI22329. Mutations in genes encoding chromatin-remodeling proteins, such as the ATRX gene, underlie a number of genetic disorders including several X-linked mental retardation syndromes; however, the role of these proteins in normal CNS development is unknown. Here, we used a conditional gene-targeting approach to inactivate Atrx, specifically in the forebrain of mice. Loss of ATRX protein caused widespread hypocellularity in the neocortex and hippocampus and a pronounced reduction in forebrain size. Neuronal “birthdating” confirmed that fewer neurons reached the superficial cortical layers, despite normal progenitor cell proliferation. The loss of cortical mass resulted from a 12-fold increase in neuronal apoptosis during early stages of corticogenesis in the mutant animals. Moreover, cortical progenitors isolated from Atrx-null mice undergo enhanced apoptosis upon differentiation. Taken together, our results indicate that ATRX is a critical mediator of cell survival during early neuronal differentiation. Thus, increased neuronal loss may contribute to the severe mental retardation observed in human patients. Citation Information: J Clin Invest. 2005;115(2):428-433. https://doi.org/10.1172/JCI23269. Neuritic plaques are a defining feature of Alzheimer disease (AD) pathology. These structures are composed of extracellular accumulations of amyloid-β peptide (Aβ) and other plaque-associated proteins, surrounded by large, swollen axons and dendrites (dystrophic neurites) and activated glia. Dystrophic neurites are thought to disrupt neuronal function, but whether this damage is static, dynamic, or reversible is unknown. To address this, we monitored neuritic plaques in the brains of living PDAPP;Thy-1:YFP transgenic mice, a model that develops AD-like pathology and also stably expresses yellow fluorescent protein (YFP) in a subset of neurons in the brain. Using multiphoton microscopy, we observed and monitored amyloid through cranial windows in PDAPP;Thy-1:YFP double-transgenic mice using the in vivo amyloid-imaging fluorophore methoxy-X04, and individual YFP-labeled dystrophic neurites by their inherent fluorescence. In vivo studies using this system suggest that amyloid-associated dystrophic neurites are relatively stable structures in PDAPP;Thy-1:YFP transgenic mice over several days. However, a significant reduction in the number and size of dystrophic neurites was seen 3 days after Aβ deposits were cleared by anti-Aβ antibody treatment. This analysis suggests that ongoing axonal and dendritic damage is secondary to Aβ and is, in part, rapidly reversible. Citation Information: J Clin Invest. 2004;114(11):1624-1634. https://doi.org/10.1172/JCI22831. Evidence suggests that Alzheimer disease (AD) begins as a disorder of synaptic function, caused in part by increased levels of amyloid β-peptide 1–42 (Aβ42). Both synaptic and cognitive deficits are reproduced in mice double transgenic for amyloid precursor protein (AA substitution K670N,M671L) and presenilin-1 (AA substitution M146V). Here we demonstrate that brief treatment with the phosphodiesterase 4 inhibitor rolipram ameliorates deficits in both long-term potentiation (LTP) and contextual learning in the double-transgenic mice. Most importantly, this beneficial effect can be extended beyond the duration of the administration. One course of long-term systemic treatment with rolipram improves LTP and basal synaptic transmission as well as working, reference, and associative memory deficits for at least 2 months after the end of the treatment. This protective effect is possibly due to stabilization of synaptic circuitry via alterations in gene expression by activation of the cAMP-dependent protein kinase (PKA)/cAMP regulatory element–binding protein (CREB) signaling pathway that make the synapses more resistant to the insult inflicted by Aβ. Thus, agents that enhance the cAMP/PKA/CREB pathway have potential for the treatment of AD and other diseases associated with elevated Aβ42 levels. Citation Information: J Clin Invest. 2004;114(11):1635-1639. https://doi.org/10.1172/JCI22928. The most common form of human congenital muscular dystrophy (CMD) is caused by mutations in the laminin-α2 gene. Loss of laminin-α2 function in this autosomal recessive type 1A form of CMD results in neuromuscular dysfunction and, often, early death. Laminin-α2–deficient skeletal muscles in both humans and mice show signs of muscle cell death by apoptosis. To examine the significance of apoptosis in CMD1A pathogenesis, we determined whether pathogenesis in laminin-α2–deficient (Lama2–/–) mice could be ameliorated by inhibiting apoptosis through either (a) inactivation of the proapoptosis protein Bax or (b) overexpression of the antiapoptosis protein Bcl-2 from a muscle-specific transgene. We found that both of these genetic interventions produced a several-fold increase in the lifespan of Lama2–/– mice. Bax inactivation also improved postnatal growth rate and myofiber histology and decreased fixed contractures of Lama2–/– mice. Thus, Bcl-2 family–mediated apoptosis contributes significantly to pathogenesis in the mouse model of CMD1A, and antiapoptosis therapy may be a possible route to amelioration of neuromuscular dysfunction due to laminin-α2 deficiency in humans. Citation Information: J Clin Invest. 2004;114(1):121-130. https://doi.org/10.1172/JCI20640. Neurofibrillary tangles (NFTs) are composed of abnormal aggregates of the cytoskeletal protein tau. Together with amyloid β (Aβ) plaques and neuronal and synaptic loss, NFTs constitute the primary pathological hallmarks of Alzheimer disease (AD). Recent evidence also suggests that caspases are activated early in the progression of AD and may play a role in neuronal loss and NFT pathology. Here we demonstrate that tau is cleaved at D421 (ΔTau) by executioner caspases. Following caspase-cleavage, ΔTau facilitates nucleation-dependent filament formation and readily adopts a conformational change recognized by the early pathological tau marker MC1. ΔTau can be phosphorylated by glycogen synthase kinase-3β and subsequently recognized by the NFT antibody PHF-1. In transgenic mice and AD brains, ΔTau associates with both early and late markers of NFTs and is correlated with cognitive decline. Additionally, ΔTau colocalizes with Aβ1–42 and is induced by Aβ1–42 in vitro. Collectively, our data imply that Aβ accumulation triggers caspase activation, leading to caspase-cleavage of tau, and that this is an early event that may precede hyperphosphorylation in the evolution of AD tangle pathology. These results suggest that therapeutics aimed at inhibiting tau caspase-cleavage may prove beneficial not only in preventing NFT formation, but also in slowing cognitive decline. Citation Information: J Clin Invest. 2004;114(1):131-140. https://doi.org/10.1172/JCI21136. Retinitis pigmentosa (RP) is a clinically and genetically heterogeneous degenerative eye disease. Mutations at Arg135 of rhodopsin are associated with a severe form of autosomal dominant RP. This report presents evidence that Arg135 mutant rhodopsins (e.g., R135L, R135G, and R135W) are hyperphosphorylated and bind with high affinity to visual arrestin. Mutant rhodopsin recruits the cytosolic arrestin to the plasma membrane, and the rhodopsin-arrestin complex is internalized into the endocytic pathway. Furthermore, the rhodopsin-arrestin complexes alter the morphology of endosomal compartments and severely damage receptor-mediated endocytic functions. The biochemical and cellular defects of Arg135 mutant rhodopsins are distinct from those previously described for class I and class II RP mutations, and, hence, we propose that they be named class III. Impaired endocytic activity may underlie the pathogenesis of RP caused by class III rhodopsin mutations. Citation Information: J Clin Invest. 2004;114(1):49-56. https://doi.org/10.1172/JCI21655. Thrombolysis is widely used to intervene in acute ischemic stroke, but reestablishment of circulation may paradoxically initiate a reperfusion injury. Here we describe studies with mice lacking protein kinase Cδ (PKCδ) showing that absence of this enzyme markedly reduces reperfusion injury following transient ischemia. This was associated with reduced infiltration of peripheral blood neutrophils into infarcted tissue and with impaired neutrophil adhesion, migration, respiratory burst, and degranulation in vitro. Total body irradiation followed by transplantation with bone marrow from PKCδ-null mice donors reduced infarct size and improved neurological outcome in WT mice, whereas marrow transplantation from WT donors increased infarction and worsened neurological scores in PKCδ-null mice. These results indicate an important role for neutrophil PKCδ in reperfusion injury and strongly suggest that PKCδ inhibitors could prove useful in the treatment of stroke. Citation Information: J Clin Invest. 2004;113(12):1701-1710. https://doi.org/10.1172/JCI20935. Bone marrow stromal cells (MSCs) have the capability under specific conditions of differentiating into various cell types such as osteocytes, chondrocytes, and adipocytes. Here we demonstrate a highly efficient and specific induction of cells with neuronal characteristics, without glial differentiation, from both rat and human MSCs using gene transfection with Notch intracellular domain (NICD) and subsequent treatment with bFGF, forskolin, and ciliary neurotrophic factor. MSCs expressed markers related to neural stem cells after transfection with NICD, and subsequent trophic factor administration induced neuronal cells. Some of them showed voltage-gated fast sodium and delayed rectifier potassium currents and action potentials compatible with characteristics of functional neurons. Further treatment of the induced neuronal cells with glial cell line–derived neurotrophic factor (GDNF) increased the proportion of tyrosine hydroxylase–positive and dopamine-producing cells. Transplantation of these GDNF-treated cells showed improvement in apomorphine-induced rotational behavior and adjusting step and paw-reaching tests following intrastriatal implantation in a 6-hydroxy dopamine rat model of Parkinson disease. This study shows that a population of neuronal cells can be specifically generated from MSCs and that induced cells may allow for a neuroreconstructive approach. Citation Information: J Clin Invest. 2004;113(12):1711-1721. https://doi.org/10.1172/JCI20926. Uracil-DNA glycosylase (UNG) is involved in base excision repair of aberrant uracil residues in nuclear and mitochondrial DNA. Ung knockout mice generated by gene targeting are viable, fertile, and phenotypically normal and have regular mutation rates. However, when exposed to a nitric oxide donor, Ung–/– fibroblasts show an increase in the uracil/cytosine ratio in the genome and augmented cell death. After combined oxygen-glucose deprivation, Ung–/– primary cortical neurons have increased vulnerability to cell death, which is associated with early mitochondrial dysfunction. In vivo, UNG expression and activity are low in brains of naive WT mice but increase significantly after reversible middle cerebral artery occlusion and reperfusion. Moreover, major increases in infarct size are observed in Ung–/– mice compared with littermate control mice. In conclusion, our results provide compelling evidence that UNG is of major importance for tissue repair after brain ischemia.